This is a crosspost from The Oil Drum. This analysis is designed to demonstrate why we believe that productive capacity relative to consumption will be sufficiently tight over the next several years to elevate crude prices to the investment cost of the marginal unit, about $100 per barrel. In fact, if annual non-OECD demand continues to grow at 3.5 percent or 1.4 Mb/d per annum, we expect another episode of deficit comparative inventory that will elevate spot prices above this mid-cycle price. We model expected net global crude oil and liquids capacity additions from 2011 to 2015 by examining announced and underway projects and by estimating underlying decline in the extant resource base. Our modeled volumes do not include natural gas liquid (NGL) production unless stated otherwise. Also, we provide several scenarios to account for uncertainty in eventual volumes, on-line schedule and decline rate. As seen in Exhibit 1, average gross new supply additions of 1.0 and 3.0 Mb/d per year have occurred since 2003. But our forecast here has annual additions moving from 2.2 Mb/d in 2011 to 1.2 Mb/d in 2015. Net of the annual decline of the underlying world resource base, about 3.6 percent, our forecast shows at loss of productive capacity of 1.8 to 2.2 Mb/d to 2015. Our 2011-2015 forecast is based on the open Wikipedia database of more than 380 conventional oil megaprojects augmented with punctual project information available in the latest IEA outlook. These new projects have peak flow rates in excess of 50,000 b/d. The megaproject contribution decreases to below 1.0 Mb/d after 2015, however, this trend has more to do with a paucity of public information beyond a five-year, line-of-sight horizon. Based on available data, it is impossible to make a precise bottom-up forecast beyond 2015. A naive forecast is possible assuming that observed past rate of new project additions will be maintained in the future. Further, we make no assumption about the yet-to-be-found (YTF) field contribution, which will impact the forecast past 2015. In summary, our forecasts aim at validating short-term production capacity additions and are based only on publicly available information pertaining to oil megaprojects. 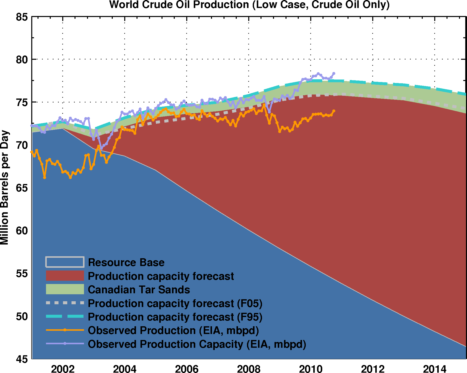 In our low case scenario (Exhibit 2), world crude oil and liquids production capacity for conventional crude oil (no NGLs) is likely to be flat for the next 3 years at around 75 ± 1 Mb/d. In our high case scenario (Exhibit 3), production capacity increases to 77.4 ± 1.0 Mb/d in 2015. This high case scenario factors in organic production growth from exiting fields and fields that are not covered by megaprojects. The two main uncertainties are 1) the pace of production capacity build up for Iraq and 2) the magnitude of small field contribution in this high price environment for non-OPEC supply. 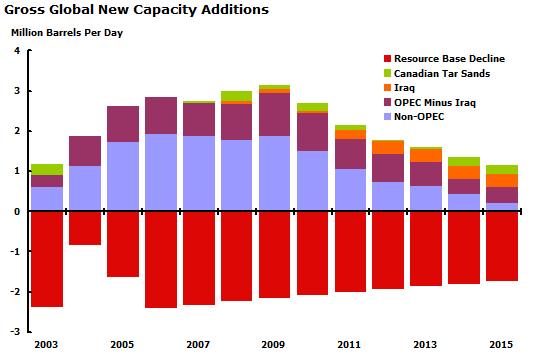 Exhibit 1: Gross new capacity additions per annum from conventional oil megaprojects. The underlying resource base decline is derived from the implied decline rate at 3.6 percent after 2006 that translates into a loss of productive capacity of 1.8 to 2.2 Mb/d per year after 2010. Exhibit 2: Low Case scenario for the world production capacity (conventional oil and Canadian tar sands) is based on the Wikipedia megaproject database. The implied resource base decline rate is 3.6 percent. The F05 forecast represents a low case estimate with a 5 percent probability Monte Carlo simulation of a lower decline rate value. The F95 is the high case estimate with a 95 percent probability of a lower value. 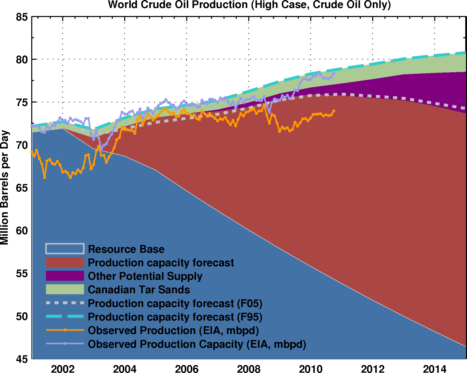 Exhibit 3: High Case scenario for the world production capacity (conventional oil and Canadian tar sands). In any bottom-up forecast, probably the most important parameter is proxy for the implied decline rate for what we call the resource base (which includes contribution from fields in production prior to 2003 and small field contributions not qualifying as megaprojects). Considerable uncertainty surrounds this number since it represents a weighted average of tens of thousands of small fields and a few hundred post-peak and ramping-up giant fields. Table 1: The world’s top 10 conventional megaprojects (volumes in thousand barrels per day, Kb/d). In their 2010 outlook, the IEA estimates the asymptotic value of the resource base decline rate to reach 8.35 percent in 2035. In addition, the IEA assumed a linearly increasing decline rate from 3 percent in 2010-2015 to 8.35 percent in 2035. No explanations were given for this choice, but an increasing decline rate value is well supported by empirical evidence derived from field-by-field datasets (Norway and the U.K.). A field-by-field analysis is possible only for the giant field contribution. A consensus, however, has emerged from recent studies regarding decline for giant fields. For example, CERA (2007), the IEA (2008) and the Uppsala University (2009) forward a production-weighted average decline value for post-peak giant fields of between 5 and 7 percent. Values will be higher for non-OPEC and for offshore fields. Our approach is based on estimating the implied decline rate of the resource base by netting off (i.e., removing) new contributions from oil megaprojects. In matching our production capacity forecast with available production capacity history for conventional oil, the implied world decline rate for the resource base is between 3.4 and 3.6 percent. This decline range is at the low end of values used in the literature but it is consistent with the short-term decline rate used by the IEA (World Energy Outlook, 2010). Exhibit 4: Observed production decline for OECD countries, including NGLs. The red curve is a logistic function fit with an URR at 580 Gb. A near-term high and low modeled valued is provided. The IEA estimates that the implied decline rates are about 5.1 percent and 3.9 percent for non-OPEC and OPEC, respectively. Therefore with IEA’s more complete data, a production-weighted average of these two values gives an implied global decline rate of 4.4 percent. As indicated earlier, this aggregate decline rate for the resource base will likely increase in the future as more giant fields enter advanced stages of decline and as offshore resources become a larger proportion of megaprojects. The top 10 largest megaprojects (in terms of flow rate) are shown in Table 1. Most of these projects are located in the Middle East or in the Former Soviet Union. Dominating this list are the new capacity increases on the super-giant Iraqi fields Rumaila and West Qurna. Work on those oilfields began this year and an expected ramp-up to almost 2 Mb/d in production capacity expected by 2016. Considerable uncertainty surrounds the status of Iraq oil infrastructure, and the country’s political stability and security. A detailed Iraq forecast is provided later in this report. Declining OECD supply is expected to slip below 85 percent of its observed peak production by 2015, as seen in Exhibit 4. 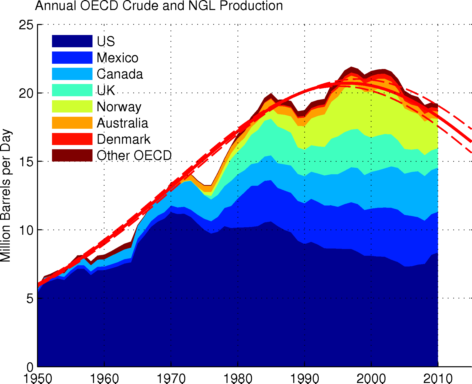 OECD output peaked in 1998 following the production decline in the North Sea and then in Mexico. The resources in OECD countries are mature and no conventional oil megaprojects are planned. Most OECD planned projects are offshore at less than 100 million barrels in size and with a peak production below 50 Kb/d. The only large projects expected in the next few years are the Chicontepec expansion (+200 Kb/d) in Mexico and the Jack project (+170 Kb/d) in the U.S.
Exhibit 5: Forecast for the Canadian tar sands production based on the Wikipedia megaproject database. Our forecast is similar to the IEA. Since OECD production is quite mature and unconstrained, future output can be estimated with a logistic function curve fitting approach, as seen in Exhibit 4. That analysis gives an ultimate recoverable resource (URR), including NGLs, of approximately 580 Giga-barrels (Gb). 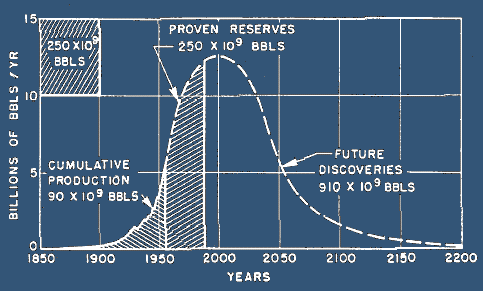 Since cumulative production is 370 Gb, remaining reserves appear to be approximately 210 Gb. This estimate is consistent with proven reserves (1P) at 183 Gb at the end of 2009 and 30 Gb (2P) of the Yet-to-be-Developed (YTD) according to the IEA. Consisting of about 300 fields–two-thirds of which are in North America with an average field size of 50 Mb (mostly offshore fields with double digit decline rates)–the YTD contribution within the OECD is expected to provide only marginal new supplies in the foreseeable future. At best, these new increments will serve to moderate the underlying decline. That established, U.S. supply has actually increased lately, in part stemming from the 20 percent of production coming from marginal or stripper wells that produce less than 100 barrels per day. Further, since 2007, the OECD annual production decline rates have slowed from 4 percent to about 1 to 2 percent in 2009. This trend will likely persist in a high price environment as old fields are reworked. Yet as a consequence of peak OECD production, the world share of non-OECD supply (crude oil and NGL) increased from 40 percent in 2000 to a near record of about 75 percent for the 2007-2010 period. This contribution is the highest since the 1970s. A decrease in OECD supply and increasing reliance on imports in particular tips the balance of control of global spare capacity to OPEC. In turn, this provides OPEC with considerable influence over global prices through use of their spare capacity. The only significant non-OPEC new contribution is in unconventional sources, mainly from Canadian tar sands, as seen in Exhibit 5. Visibility on tar sands megaprojects is good (2020) due to the capital-intensive nature of the projects. Observed production has closely followed forecasts. Bakken development will contribute also, but not enough to prevent a decline. OPEC production capacity (crude oil, condensates) is expected to increase from 34.5 Mb/d in 2010 to above 36 Mb/d in 2012-2015, as shown in Table 2 and Exhibit 6. Nearly half of the 2010-2015 increase of 2 Mb/d in production capacity will originate in Iraq. Considerable uncertainty therefore needs to be attached to that potential volume. Also from the total OPEC volumes, the inferred decline rate for the resource base is between 1.5 and 2.1 percent. That level of decline is consistent with the vast majority of production coming from giant and super-giant fields in plateau production mode, as are OPEC’s large fields. The IEA estimates a higher decline rate of 3.9 percent. In other words, our model is a conservative case. Table 2: Forecast for OPEC production capacity (crude oil only) in Mb/d. 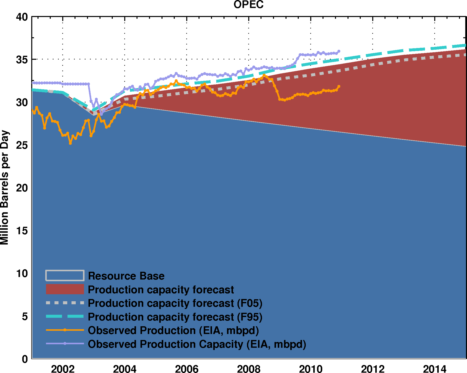 Exhibit 6: Forecast of OPEC production capacity (conventional oil) based on the Wikipedia megaproject database. The implied resource base decline is 1.6 percent. The F05 forecast is the low case estimate with a 5 percent probability of lower values. The F95 is the high case estimate with a 95 percent probability of lower values. Exhibit 7 shows our production outlook from Iraq. In 2010, new contracts equivalent to 10 Mb/d of new capacity were signed with international oil companies (IOCs), as noted in Table 3. While growth is reflected in our projection, a bottleneck, however, on production capacity development is now defined by logistics and other factors (e.g., export infrastructure, rig availability, political and security uncertainty, and potentially corruption). In their last assessment, the IEA warned that significant investments would be necessary to improve the severely impaired production and service infrastructure. Their forecasts have output reaching only 3.5 Mb/d in 2015 and 6.0 Mb/d in 2025. The EIA is even more pessimistic in their reference scenario with only 2.8 Mb/d in 2017 and 6.1 Mb/d in 2035. Historically, the largest production build up observed in an OPEC country was a 2.0 Mb/d increase over 5 years. Russia increased capacity by 3.8 Mb/d over ten years. In our modeling, this assessment is equivalent to quadrupling the production ramp-up time. Our low forecast in Table 4 amounts to a steady increase in capacity of between 0.2 and 0.3 Mb/d per year, which is still clearly optimistic. Table 3: Results of Iraq Bidding Rounds and IOC winners. Table 4: Forecast for Iraq production capacity (crude oil only) in Mb/d. 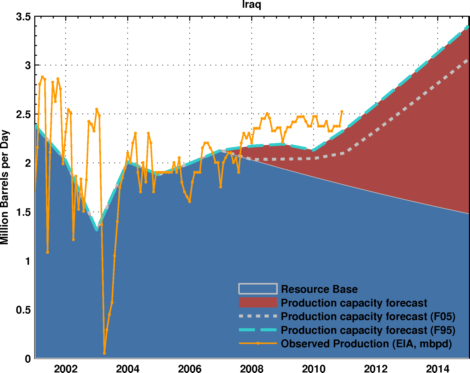 Exhibit 7: Forecast for Iraq production capacity (conventional) based on the Wikipedia megaproject database. The implied resource decline rate is 4.0 percent. The F05 and F95 forecasts are as in the OPEC case. 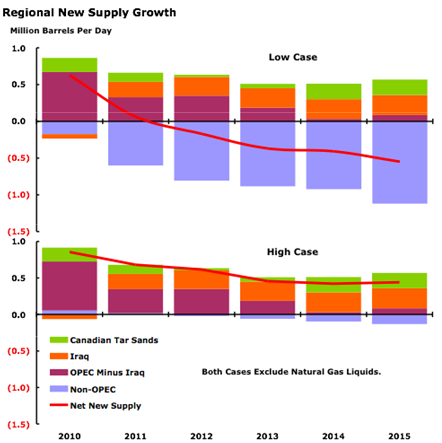 The IEA forecast is from their Medium Term O&G Markets 2010. The IEA forecasts a net crude oil capacity addition of 0.43 Mb/d in 2015 with total production capacity reaching 11.7 Mb/d, as seen in Exhibit 8. Saudi Arabia increased its crude oil production capacity by 1.5 Mb/d in 2009 with the completion of the Khurais (1.2 Mb/d) and the Shaybah (0.3 Mb/d) projects. Other projects include Nuayyim (0.1 b/d). The Manifa oilfield redevelopment is expected to contribute 0.95 Mb/d in Arabian Heavy Crude (28 API) and condensates. Discovered in 1957, the field was developed but later mothballed due to the grade of its crude. To get this heavy oil to the market, significant downstream development is necessary. Saudi Aramco plans to build two new refineries, Yanbu and Jubail, of 400,000 b/d capacity each. The Yanbu project, however, was delayed since Conoco-Phillips withdrew from the deal in April. The commissioning of Manifa’s first phase is scheduled for 2013 and project completion is expected in 2015-2016. Even if oilfield production capacity increases, Saudi Arabia needs to build significant attendant infrastructure (e.g., gas-oil separation plants, crude stabilization and water injection facilities). Yet domestic consumption in Saudi Arabia is currently growing at more 0.2 Mb/d per year. From 2008 to 2009, for example, domestic consumption grew by 9.8 percent (BP Statistical Review). The increase in Saudi use, for example, results in lower net exports. Our forecast shows a decline in total Saudi production capacity of between 0.2 and 0.6 Mb/d from 2010 to 2015. The details are shown in Table 5. This decline, if it occurs, puts crude oil only production capacity for Saudi Arabia between 11 and 12 Mb/d in 2015, which is consistent with the IEA forecast. Table 5: Forecast for Saudi Arabia production capacity (crude oil only) in Mb/d. 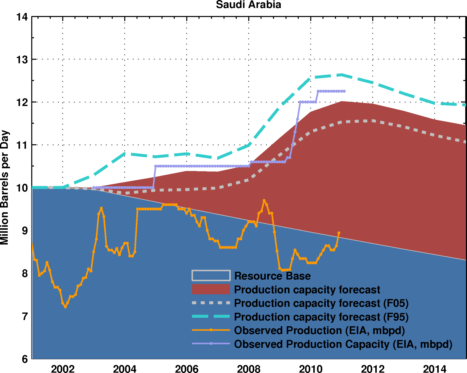 Exhibit 8: Forecast for Saudi Arabia’s production capacity (conventional oil) based on the Wikipedia megaproject database. The implied decline rate for the resource base is 1.8 percent. The F05 forecast is the low case estimate with a 5 percent probability of lower values. The F95 is the high case estimate with a 95 percent probability of lower values. From the megaproject database only, our low case scenario in Exhibit 10 shows that conventional non-OPEC production continues to erode by 0.5 Mb/d per year increasing to 1.0 Mb/d in 2015. The implied decline rate is estimated to be between 5.7 and 6.0 percent. This value is consistent with the IEA estimate of 6.4 percent. The top ten non-OPEC megaprojects are in Former Soviet Union (Kazakhstan and Azerbaijan) with the Tengiz and Kashagan projects. In Russia, the Vankor field will reach its production plateau in 2011 (0.3 Mb/d). A pure megaproject approach, however, will have shortcomings here mainly because additions will come from smaller fields as we already noted for OECD countries. All non-OPEC supply additions are therefore difficult to track with a bottom-up approach, meaning that despite our best efforts, we may miss a significant new or incremental source volume. The recent 2009-2010 increase in non-OPEC production can be clearly explained by an increase in upstream investments as a consequence of sustained high oil prices. The IEA raised their outlook by about 1.0 Mb/d for non-OPEC from December 2009. A greater contribution from marginal supply in the U.S. (wells producing less than 100 barrels per day) can be observed. Further, the production decline has slowed notably in Norway and Mexico fields. Consequently, we believe that a bottom-up approach for conventional non-OPEC production based on published oil megaproject information may underestimate reserve growth and small field contribution leading to an overly pessimistic outlook. 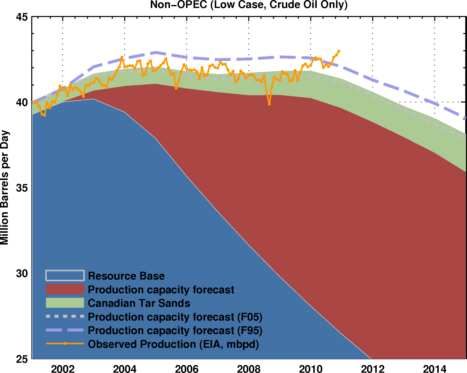 Our high case scenario in Exhibit 11 shows a production plateau for non-OPEC at near 43 Mb/d. This scenario, however, is conditional on a persistent high oil price environment, which is likely given the dynamics in play for the next several years. The original non-OPEC endowment estimate at yearend 2008 was 1.4 trillion barrels with about 270 Gb of proven reserves (including NGLs). The USGS estimates reserve growth of 160 Gb and 370 Gb of future discoveries (to be realized over the 2009-2025 period). According to the IEA, a significant amount of yet-to-be-discovered reserves (2P) exist, estimated at about 125 Gb of which 38 percent are onshore. The non-OPEC YTD is in some 1,250 oilfields with an average field size of 100 Mb, many of which are likely associated with marginal flow rates (below 50 Kb/d). The cumulative production for non-OPEC is about 690 billion barrels at the end of 2010, which means that resource depletion is close to 50 percent. A logistic curve fitting approach gives about the same estimate for total recoverable volume as shown on Exhibit 9. The resulting logistic curve gives a significantly less abrupt decline as provided in Table 6 and as illustrated in Exhibit 11. Again, this is from the high case. Therefore, the total volume unaccounted for by megaprojects is around 76 Gb. We believe the resulting difference in the flow rate projection can be attributed to reserve growth and increase in marginal supply from YTD resources. This then is the basis for the high scenario (Exhibit 11). 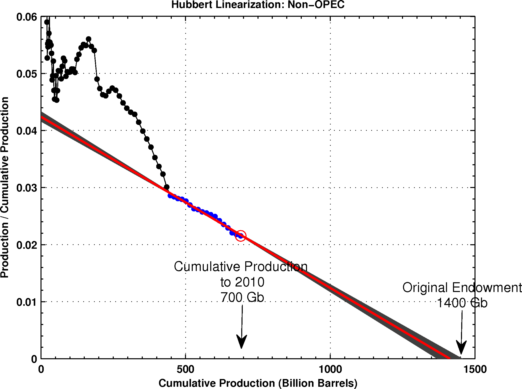 Exhibit 9: Representation of conventional non-OPEC production in a cumulative versus production-cumulative space. The resultant linear fit (pink trend) suggests an URR of approximately 1,400 Gb. The original endowment taking into account proven reserves, reserve growth and future discovery estimates (USGS) points toward the same value. Table 6: Forecast for non-OPEC production capacity (crude oil only). Exhibit 10: Low case scenario for non-OPEC production capacity (conventional oil) based on the Wikipedia megaproject database only. The implied decline rate for the resource base is 5.7 percent. The F05 forecast is the low case with a 5 percent probability of lower values. The F95 is the high case with a 95 percent probability of lower values. 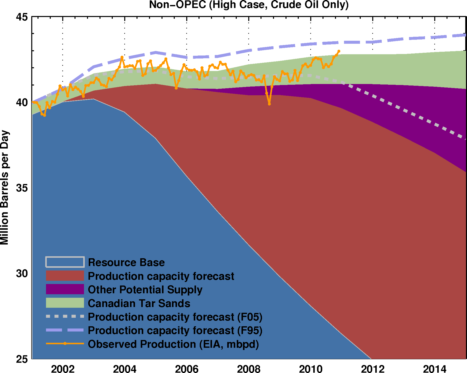 Exhibit 11: High case forecast for non-OPEC production capacity (conventional oil) based on the Wikipedia megaproject database only and a logistic-based modeling for unaccounted for small field contributions. The implied base resource decline rate is 5.7 percent. Russia was the top net exporter in 2010 after a slowdown in production in 2008. Given the recent production growth from resources noted earlier, the implied decline rate for the resource base is estimated to be between 1.8 and 2.2 percent. This relatively low decline rate can be in part explained by the high reserve growth observed in Russian oil fields (refer to USGS study from Verma et al.). As seen in Exhibit 12 and Table 7, production capacity could grow by 200 Kb/d per year until 2012 and then a decline is likely after 2013-2014 if no further significant megaprojects come on-line. 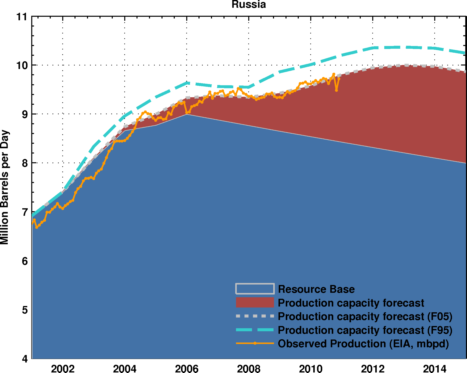 Exhibit 12: Forecast for Russia’s production capacity (conventional oil) based on the Wikipedia megaproject database. The implied decline rate for the resource base is 1.8 percent. Table 7: Estimated production capacity for Russia (crude oil plus condensates only). The modeling in this section on global crude supply relies on the open Wikipedia megaprojects database. The work draws on IEA, EIA and USGS databases and reports. Furthermore, the Monte Carlo simulations on decline take advantage of publicly available data and academic research. The intent is to frame reasonable probabilities for near-term production change. As noted, the data to 2015 is the most robust, while development beyond 2015 holds too much uncertainty save for an educated guess. To be fair, this work is a line-of-sight estimate that may not benefit fully from on-going work in extant fields to increase recovery rates, delays or to produce marginal fields in this high crude price environment. For that reason, we model a low and high case. The high case incorporates incremental supply from the extant resource base. Caveats aside, this work demonstrates that even under the most favorable conditions, a decrease in new resource additions is anticipated through 2014, at least. The overall decrease is shown in Exhibit 13 for both low and high cases. The decrease is a consequence of decline of 3.6 percent to the underlying extant global resource base in the face of modest capacity growth. According to our modeling, the expected change (mostly decline) in global crude and condensate productive capacity is provided in Table 8. The modeling does not include the considerable NGL contribution expected stemming from massive investments in the last decade in liquefied natural gas. Just within OPEC, NGLs have increased from 4.6 to 5.1 Mb/d from 2009 to 2010 and are expected to move to 5.8 Mb/d in 2011. Nonetheless, in the low case, net global productive capacity additions, after factoring in the decline of the resource base, is expected to drop though 2015 at an increasing pace. In the high case, an insignificant growth is modeled for 2015. Given the annual demand growth rate in the non-OECD of about 1.5 Mb/d, the modeled production growth rate in either case suggests that OPEC spare capacity will be trimmed over this time horizon. Table 8: Estimated change in global production capacity (crude oil plus condensates only, no NGLs). Exhibit 13: Estimated change in global production capacity (crude oil plus condensates only). Note: this report was produced in December 2010 so the baseline is September 2010 (there is a 3 months lag in the data provided by the EIA Monthly Energy Review). However, I've updated the charts using the last available EIA MER (data up to December 2010).